This manual provides an overview of the world of autism spectrum disorders (ASD). It was developed by Ohio parents of individuals with ASD who have a broad range of experience with interventions, resources, and services. The group's work began with the question: What do you wish you had known the first year your child was diagnosed? The manual covers a wide range of topics of interest to families, and each chapter contains rich reference materials, including books, websites, and names of organizations where additional information on each topic may be obtained. Follow this 4-step process if you suspect your child may have autism. Understand autism spectrum disorder and its underlying characteristics associated with it. Gain information on the screening, evaluation and diagnostic assessment process. Also, learn about conditions that may co-exist with ASD. Obtain information on living with autism with a focus on the family unit and how to address common family issues, including difficult moments. Learn about the many interventions that support individuals with ASD. Review information about special education, including assessment, qualifying for special education services, parent rights, and the components of the IEP. 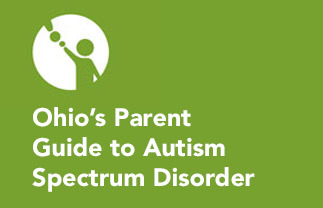 Learn about Ohio's social service programs that provide services and supports to eligible individuals with ASD and their families. Gain knowledge about advocacy and the importance of seeking support. Discover ideas about transitioning to adulthood and future planning, including guardianship, estate planning, and trust funds. Find the definition of autism spectrum disorder according to the DSM V.
Find helpful forms, along with a newsletter devoted to the topic of Home-School Communication. Forms can be printed for personal use. Learn about what you can do when you disagree with the school district's decisions regarding your child's educational program. View an example of the letter parents can write to request a Multi-Factored Evaluation to support a comprehensive review of your child's educational program. Review a chart illustrating the process for determining eligibility for special education services.